Jaipal, K. & Figg, C. (2010). Unpacking the “Total PACKage”: Emergent TPACK Characteristics From a Study of Preservice Teachers Teaching With Technology. 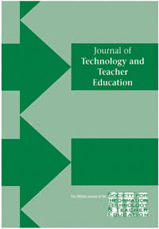 Journal of Technology and Teacher Education, 18 (3), 415-441. Waynesville, NC USA: Society for Information Technology & Teacher Education. Retrieved April 22, 2019 from https://www.learntechlib.org/primary/p/28335/.